Enjoy our great tasting Premium Fire Grilled chicken tenders from Cooked Perfect. 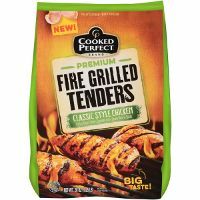 Our Fire Grilled tenders are made from premium chicken and seasoned with savory spices.Cooked Perfect Premium Fire Grilled chicken tenders are grilled over an open fire to lock in their juices and bring out their delicious flavor. The fire grilling ensures that our tenders stay tender on the inside.